Those four walls I call home will never see the inside pages of Better Homes & Gardens®--you just have to trust me on this. It isn't because the house isn't architecturally unique because we've altered it in such a way that compared to ours the Tower of Pisa appears quite stable. But it isn't the outside of our domicile that causes me concern. It's the inside. Again we'd garner no glossy, full color spread in any mag or rag. It's just a two-bit small house expanded to its maximum spread without much consideration for the décor—until just lately. It must be my age. Yep, it's gotta be. Until last year I thought that coordination in décor came as a "bed-in-a-bag." That was the extent of my decorating abilities. When I grew up there wasn't much thought given to decorating. Well, Mom may have thought about it but the rest of us kids didn't—we just had to help her keep it clean. The woman was nothing if not a "clutter-keeper." She had Daddy build shelves to put all those happy little objects d'art on along with the bowling trophies. Ugh! It was too much to dust! One guess who had dusting duties? Sigh . . . I HATE dusting. I'll scrub toilets and walls and baseboards (minor horrors those) and vacuum until the cows come home, but I despise dusting "precious objects." Therefore I hate clutter and keep all that special stuff in the china cabinet that only requires a bi-annual clean-out. I will also throw out any and all things possible from said breakfront. We won't discuss my office and my problem with "paper retention." Just know that I don't have a problem. I can quit any time. My life could be a joy if I didn't live with the "clutter twins." It's a father and daughter team that provide me with such a challenge. They find that there is no clean, clear space that they cannot pass without marking their passage. Whether it be dirty laundry, the spoils of empty pockets, or the remnants of an evening snack—wherever they are is wherever they mess. Did I say we live in a house small enough to make a rabbit nervous? Well, a hutch is spacious . . .
Clutter is my enemy. Yet decorating is my Achilles heel. I have no talent, no gift, and no flair. About a dozen years ago hubby and I decided to spend some bucks to make the house hobbitable, hum, habitable. We knew we only had so much room to deal with in our living room which would be the room outside of the bedroom and the kitchen that we'd spend most of our time in. Thus we talked about it and worked it out. There were only so many inches to go around. With a 15' by 12' room that also acts as a passageway to the rest of the house, it was squeezed. There would be no big "playpen" L-shaped couch (sofa) along with a TV and chairs. It simply wouldn't fit. 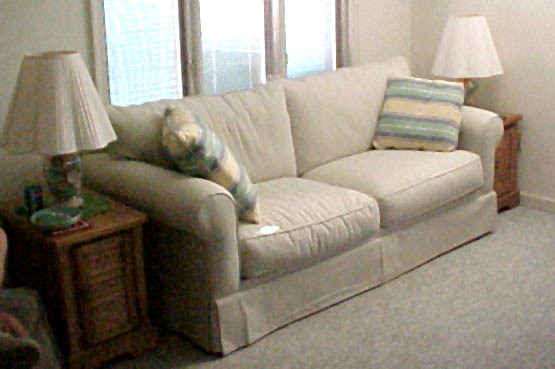 Moreover a regulation couch (sofa) could make the room too tight for comfort. As we'd already brought an old couch with us it WAS tight but that wasn't my primary reason for ditching the couch—sigh (sofa). There has been a huge battle over "couch" and "sofa" in this house. It's not just a term anymore but a way of life. Hubby insists that the proper term is "Sofa" and not "Couch." He tells me the "couch" means you were poor. Funny thing is neither of us grew up rich. Still, it's been bothering me for some time so I researched it. The earliest term for such a contrivance is---"COUCH" so I win! Of course there is also the "divan" and "settee." Never fear—"Couch" was first. "Sofa" is just a more modern term for it. Way back when, we opted for two stout recliners and a loveseat with a few small tables with lamps for reading. It filled the space. Wallhangings were optional and we found a few that fit over the years. Then there were the clocks! My primary reason for the loveseat was to keep hubby from spending his sleeping hours on the "couch." It was something he'd done from childhood and during our early-married years annoyed me to no end. So a loveseat ought to have cramped his style a bit. It did right up until he awoke with a bad headache in the wee hours. I wouldn't have thought it but that awfully stiff and short loveseat became his haven on and off. It should have been a torture chamber. Now, some twelve to thirteen years later, it's time to upgrade. Somehow, my cats who have no claws, no strike that, my eldest cat who has no claws but pretty darn sharp nubs has finally ruined my loveseat beyond my ability to darn with yarn. (Okay, so I used to needlepoint and with that rough textured fabric I used to be able to pull it back together with a blending yarn). Old, aging Spike was now ripping out the stuffing. Did I say this cat approaching sixteen years has NO claws? He doesn't—but don't let him paw you—you'll bleed. He's spent most of those sixteen years trying to re-grow those claws and sharpen his nubs. He's done a pretty good job. For the last eight months there has been the growing mumbling and grumbling throughout the house. That tiny, war-torn loveseat no longer fit into the room. Its ragged appearance had become an eyesore and my daughter declared she found it no longer comfortable—meaning she can't stretch out in it anymore. Funny thing was that I thought when I'd bought that ugly beige knobby-textured loveseat that it would last forever. It surely was homely enough and that type of furniture always does manage to wear well. Didn't being a Lazy-Boy® count for anything? The two recliners did! They have worn well and seem capable of lasting another 13-15 years with the usage and care that we give them. And while they may no longer be that medium blue with lines and a tad more dingy. While they are cleaned regularly, Febreezed® often, and shampooed occasionally, their innards seem as stalwart as new and their cushions perhaps a tad more welcoming than that alien feeling of "new." It was earlier this month that the decision was made. It was on the 4th of July that I made my trip to hubby's favorite furniture store—Donaway's in Ocean City, MD. Only about 30 minutes away from home to that beach resort. The store was filled with all that one could want or imagine in such a place. Everything was light, airy, and filled with $$$ signs. This place wasn't RentCo or Furniture R Us or Discount Warehouse. I don't buy furniture often and rarely go to a quality store. My checkbook just would shudder if I did—but in I went and both of us shuddered. I knew when I entered the store that I was expected. It was one of those episodes in your life that you dread. My hubby knew everyone there and I didn't. I'd almost rather that they didn't know me. It wasn't that I didn't have the money to spend but rather that I'd have to be on my P's & Q's and I was terrified that I'd disappoint in impression. Therefore, I babbled like an idiot. Thus the visit to this store was two-fold. I was there to decide upon which was to be our new "couch" that we'd buy for the house (not a sofa) and to meet a few folks that Don held in high respect. It was a daunting challenge. I had just dropped off my daughter, my niece and her boyfriend about ½ hour away at the water slide park and would meet them after my selection so I wasn't exactly dressed for company. It was a store of caliber that you would expect they'd meet you at the door. They did. I foundered. I asked for "Helen" and was advised that she'd meet with me shortly—she did. During that intervening time I was allowed to view the store. In the beginning I did what anyone would do, I just looked around. Instantly I was drawn to the "sofas" (cough-cough, not "couches") and mentally said, "yes, no, no, no, yes, maybe, no, no, no, maybe, yes, maybe, yes, no, maybe—right up until—THAT'S WHAT I WANT!!!" Then I knew I couldn't have it. Don hates puffy, comfy, light-colored, inviting looking couches—(sofas) just because they might get dirty, worn, and that puffiness might collapse quickly. Ahem, (try to think in baritone with me), better a stiff and stalwart sofa than one that will yield and become mush. All his musings met with nothing. Did I select that "sofa" I wanted? No, alas I didn't. I selected something along the lines of that austere guideline that I thought HE would want. It appeared as stiff as the virgin queen's stays and just about as forbidding. There was no "ahh" in this sofa (couch) at all. It seemed designed to move you quite shortly after your discovery of descent upon its cushions. If you don't like visitors then this would be the couch for you. The kid would have preferred the floor. But I picked it anyway. I had been told by hubby to pick "anything I wanted" in the store along with a few end tables if I wanted them." I picked that atrocious couch (sofa) as a compromise because I thought it would be what hubby wanted and then picked what I wanted for end tables. Meanwhile, Helen had to leave me to take a call. I took that opportunity to rush back to that one couch (sofa) that I really wanted. I wanted to sit upon it and allow it to swallow me up in comfort. It performed just how I knew it would. Then Helen came back and I gave my order for the one I didn’t want but thought that hubby would. How wrong can one person be? It didn't take but a few days to discover that Don despised the choice I had made on his behalf. It was almost funny. He thought that it had been a joke. In the end, he went back and chose the very one that I had wanted so much. Now our little living room is a bit smaller for the addition of that big sofa (okay, I'll say "sofa" now instead of "couch") and it makes the entire room a welcoming respite. I've added new lamps and shades to compliment it which is something that I've never done before. Perhaps it's because I'm past 40 now. The fine lines of a home should offer a balance, a beauty, and perhaps a statement of who resides within. After a mishmash of castoffs, budget-buys, and catch-as-catch can—just quelling the clutter of my home makes is worthy of home beautiful for me. Tossing about 50 magazines for woodworking, architecture, Sears work clothes, unique toys and gems, coins, and such, evacuating the paper from the house for a burn could likely keep us warm for months to come. But I get tired and what comes in doesn't necessarily go out with the same speed. Then it builds. It grows. Clutter is gifted with a life of its own. Even rabbits don't reproduce with this speed and I'm one to know because that's all I see around my house—lots of corn and lots of bunnies. It must come from that warped, freaky fairy we catch a rare glimpse of flitting just beyond our range of vision. I swear I know her from her demented laughter alone. From dump to domicile to demigod palace, our homes are our small kingdoms. It matters not if they are filled with maddening clocks that can't keep time and chime the hours incessantly or if we are the paper-keepers of the next millennium or even if we have that one room that we shut the door on when company comes. Hey, if company comes and they actually come inside and don't run away screaming then it might not be as bad as we think it is. If I keep at this with the lamps and doilies and such, I might be ready for real company outside the family by September. Whaddya think? Just don't scare my bunnies away. They guard the house and all its clutter.